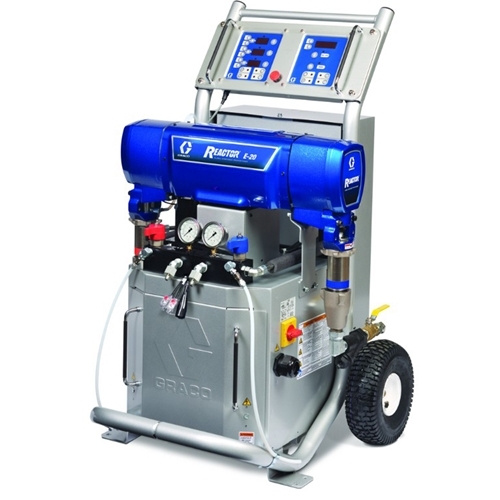 The Graco E-20 Reactor is an electric proportioner that offers total control when spraying. It is used primarily for medium to high output jobs, and comes standard with advanced features that will help extend the life of your equipment. The E-20 is equipped with system diagnoses along with material data storage. The E-20 operates at a 2,000 PSI max working pressure, and has a max hose length of 210 feet. Max fluid temperature comes in at 190 degrees Fahrenheit, and spray foam out put is at 20 pounds per minute. Control the pressure and temperatures with digital programming, allowing you to easily monitor performance during a job. The standard hybrid heater provides a more accurate temperature control, and with the electric motor comes better efficiency and ultimately more reliable performance. Tap settings are not required on the heat transformers, and down time is minimized thanks to modular heat control boards – Making troubleshooting and replacements simpler. Use the E-20 by Graco on your spray foam insulation jobs, including work on roof patches, window repairs, rim joists and general prep. For coatings, the E-20 is ideal for joint filling in concrete and floor applications, cold polyurea tank spraying, hybrid polyureas and other smaller industrial jobs. Select your Graco equipment lineup from start to finish, right here at the Intech Equipment and Supply store. Our trusted experts are available to assist you now with comparison and selection, as well as every step of the way in the future. Browse or visit us at one of our locations across the US – and make Graco the standard on your jobsites from the ground up today!